I figure by now you may have made the Goat Cheese, Pancetta & Chive Stuffed Mushrooms from my previous post – if you haven’t…get crackin! Here is one of the lovely creations I made with the left-over goat cheese stuffing. For those of you who haven’t seen that particular recipe, I urge you to take a look. It is really delicious. But for right now, the goat cheese stuffing I am referring to is goat cheese, cream cheese, pancetta, shallots, garlic and chives all whipped together. How could you go wrong! I toasted an english muffin, though I must admit, I think a nice thick toasted crusty slice of french bread would have been better. Alas, there was no such bread in the kitchen and by the time I went out and found it, breakfast would have been long over! 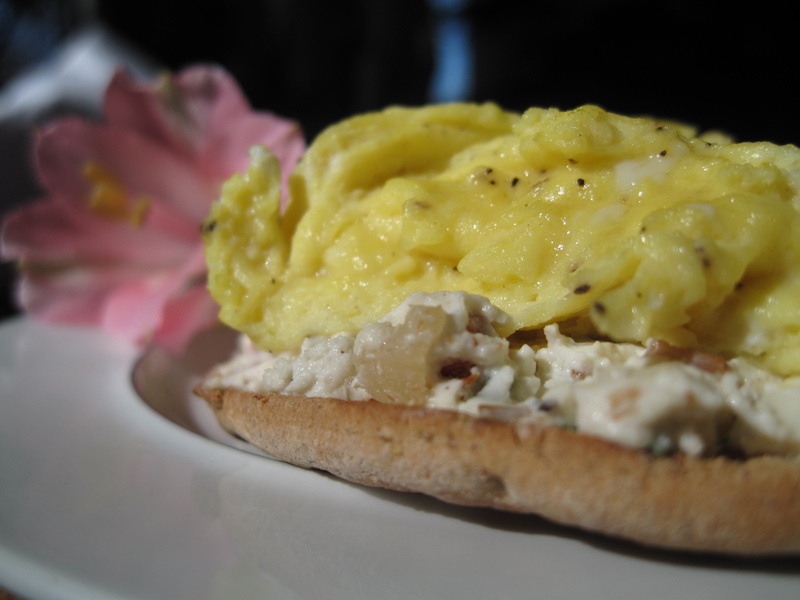 I smeared a healthy dollop of that delicious goat cheese, pancetta filling over it and then topped it with freshly scrambled eggs. Boy was my husband surprized! Give this one a whirl! Toast your bread of choice. Spread left-over Goat Cheese Stuffing over one side. For those of you who are not interested in mushrooms, I will include the goat cheese stuffing part of that recipe below. However, it will make quite a lot of this stuffing, you may want to half the ingredients. 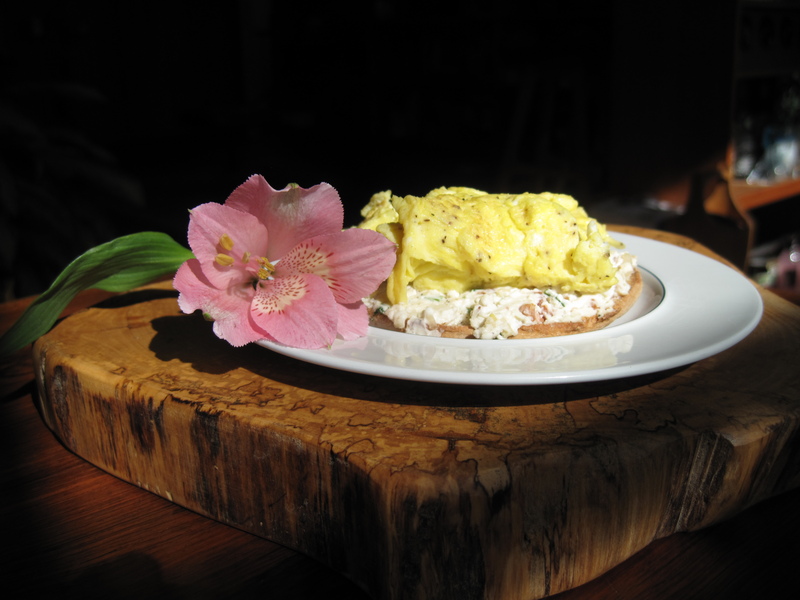 Place eggs over top of Goat Cheese Stuffing topped toast. In a medium bowl, mix cream cheese and goat cheese until combined. Set aside. Heat a medium frying pan over medium-high heat. Cook the pancetta until golden (about 1 1/2 to 2 minutes per side) until golden (the pancetta will crisp up as it cools). Remove to paper towels. When cool, crumble the pancetta and set aside. In the same pan, saute the shallots in the pancetta drippings until softened (about 3 minutes). Add garlic and cook for another minute. In a medium bowl, mix the cream cheese and goat cheese until combined. Add the crumbled pancetta, shallots and garlic, chives, salt and pepper. Stir to combine.